Dan Turner was born on July 28, 1943, in Tilton, Illinois. He enlisted in the U.S. Army on December 14, 1960, and then completed basic training and Advanced Individual Training as an engineer at Fort Leonard Wood, Missouri, in March 1961. PFC Turner next attended U.S. Army Signal School at Fort Gordon, Georgia, from March to May 1961, followed by service with the 529th Signal Company at Fort Sill, Oklahoma, from May to October 1961. He deployed with his unit to Europe in support of the Berlin Crisis from October 1961 to August 1962, and then served with the 529th Signal Company at Fort Carson, Colorado, from August 1962 to December 1963. During this time, Sgt Turner deployed to Florida in support of the Cuban Missile Crisis from November to December 1962. He left active duty on December 14, 1963, and reenlisted in the Army as an Infantryman on January 28, 1964. After completing Army Security Agency training, Sgt Turner deployed to Southeast Asia and served with the 8th Radio Research Unit attached to the 1st Special Forces Group in South Vietnam from September 1964 to October 1965, and during this time he attended Airborne School with the 1st Special Forces Group on Okinawa in September 1965. His next assignment was with the Army Security Agency at Two Rock Ranch Station in Petaluma, California, from November 1965 to March 1967, followed by Infantry Officer Candidate School at Fort Benning, Georgia, from April 1967 until he was commissioned a 2d Lt of Infantry in the U.S. Army on September 28, 1967. Lt Turner served with the Ranger Department in the Combat Conditioning Committee at Fort Benning from September 1967 to August 1968, and then served as a Platoon Leader and then Company Commander with 1st Battalion (Airborne), 503rd Infantry Regiment of the 173rd Airborne Brigade in South Vietnam from August 1968 to September 1969. His next assignment was as a Company Commander with 2nd Battalion, 325th Airborne Infantry Regiment of the 82nd Airborne Division at Fort Bragg, North Carolina, from September 1969 to February 1970, followed by service as B Detachment Commander with 6th and 5th Special Forces Group at Fort Bragg from February 1970 to November 1971. During this time, Captain Turner served as Commander of Redwine Security Group on the Son Tay Raid, a clandestine mission to rescue American Prisoners of War held in North Vietnam on November 21, 1970. He attended the Infantry Officer Advanced Course at Fort Benning, and then remained on and served as an instructor with the Infantry Officer Basic Course from November 1971 to December 1972. 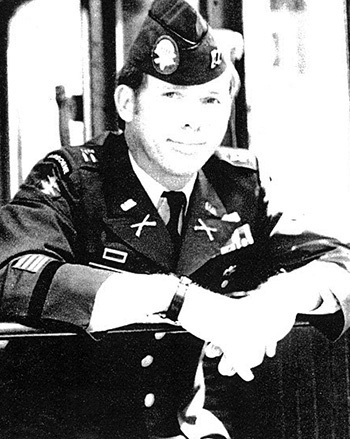 Captain Turner next completed his Bachelor's Degree in Business Administration at William Carey College in Hattiesburg, Mississippi, between January and December 1973, and then served as A Detachment Commander with the 1st Special Forces Group on Okinawa from January 1974 until that unit was deactivated in July 1974. His next assignment was as A Detachment Commander and Assistant S3 (Operations Officer) with the 10th Special Forces Group at Fort Devens, Massachusetts, from July 1974 to May 1977, followed by service as a Small Arms Division Chief and Airborne Test Officer with the U.S. Army Infantry Board at Fort Benning from May 1977 until his retirement from the Army on February 1, 1981. Dan Turner died on April 6, 2015. For gallantry in action on 21 November 1970 as a member of an all-volunteer joint U.S. Army and Air Force raiding force in the Joint Chiefs of Staff-directed heliborne assault mission to rescue United States military personnel held as prisoners of war at Son Tay prison in North Vietnam. This valiant effort was motivated by deep compassion for his imprisoned fellow men-at-arms, and by a strong sense of military duty and national pride. Captain Turner, leader of the command group, displayed outstanding leadership, personal courage, and presence of mind while leading the assault of his group in the target area. Although his elements had gone into the attack following original orders he noted that one of the assault helicopters had not landed as planned. Realizing that immediate action was required to institute an alternate plan, he fearlessly exposed himself to the enemy small arms fire as he moved repeatedly to positions where he could direct the deployment of his elements. During this period, he was repeatedly fired upon by the enemy with automatic and small arms fire. He returned accurate fire upon these enemy positions, neutralizing them sufficiently to continue his mission. When the delayed raiding force group landed, he once again exposed himself to fire in order to maintain the same sure, professional control over his unit and to place safely the delayed element into position. Captain Turner's conspicuous disregard for his personal safety, extraordinary heroism against an armed hostile force, and extreme devotion to duty are in keeping with the highest traditions of the military service and reflect great credit on himself and the United States Army. 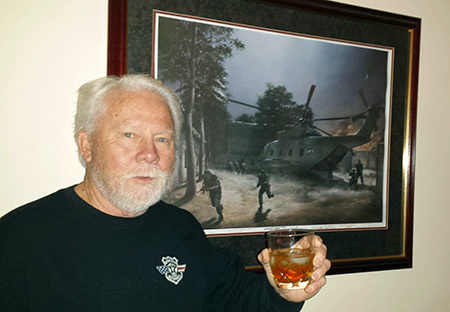 Dan making his final toast to his fellow Son Tay Raiders, all of the NAM-POWs, and to Special Forces Warriors of the past and today; on the 44th anniversary of the Son Tay Raid - 20-21 November 2014.